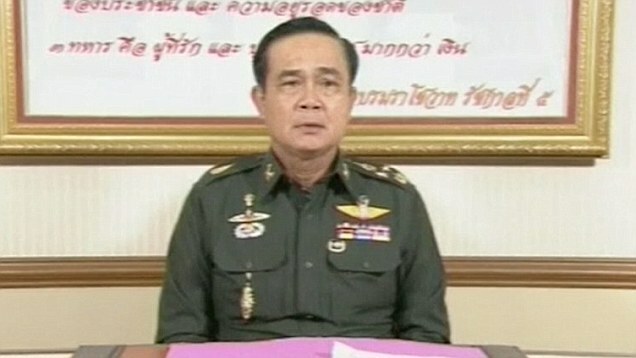 General Prayuth Chan-ocha addresses Thailand to announce the military seizure of power. Watch the subtitled video. After months of political unrest, the Thai military yesterday seized control of the country in a military coup and imposed martial law across the country. Prime Minister Yingluck Sinawatra has been detained by the military, and six senior military officials have been appointed to run the government. Unlike the 2006 military coup against Yingluck’s brother (and Prime Minister of Thailand from 2001-2006), Thaksin Shinawatra, the Thai military is not promising a quick return to civilian rule. Instead, statements by General Prayuth Chan-ocha suggest that the military may seek to retain power for a considerable amount of time. Thailand has been rocked by political instability since Prime Minister Yingluck Sinawatra assumed office in 2011. The simple version is that Thai politics have been sharply divided between rural peasants, who constitute a majority of the Thai population and support the populist Sinawatra political regime, often referred to as “Red Shirts,” and the smaller but influential urban middle and upper classes, often dubbed “Yellow Shirts.” While the Yellow Shirts have been well organized and vocal in their opposition to Yingluck’s caretaker government, they lacked the votes to affect political change through the ballot box. But on Tuesday, the Thai Constitutional Court ruled that Prime Minister Yingluck had acted illegally when she transferred her national security head, and ordered her and several key ministers to step down. This sparked the military’s decision to move into the political vacuum. So what’s next for Thailand? With a per capital GDP of about $5,400, Thailand boasts Southeast Asia’s second largest economy, and the country was recognized for its successful economic development. But the 1997 Thai baht crisis (and sharp declines in the value of the baht again in 2013) undermined much of the progress, and inequality in Thailand remains very high. The coup will no doubt undermine tourism in the country, which accounts for more than 10 percent of all economic activity in the country. Political unrest—whether the result of the military coup or of a protracted political standoff between Red Shirts and Yellow Shirts that results in violence—will certainly not benefit the Thai economy. What do you think? How will the political standoff in Thailand be resolved? Will the military hand power back to a civilian regime? When? And how will the regime—military or civilian—be able to bridge the ongoing political and economic divisions at the heart of Thailand’s current crisis? It was a busy week for the U.S. Federal Reserve. Addressing a meeting of bankers on Friday, the Chair of the U.S. Federal Reserve, Ben Bernanke, called on legislators to address the need for regulatory reform of global financial markets. On Wednesday, the Federal Reserve undertook announced new plans intended to improve the position of the U.S. credit markets. With the federal funds rate remaining near zero percent, the Federal Reserve has been forced to turn to a program of qualitative easing, under which it purchases mortgage-related securities, removing them from the market and expanding the amount of cash in circulation. It is coordinating policy with the central banks of England, Japan, and Switzerland. But the dramatic move carries a number of risks, including the introduction of high rates of inflation and a decline in the value of the dollar. 1. A two-day meeting of the European Union last week produced a number of important outcomes, including a commitment to increase the E.U.’s contribution to the International Monetary Fund by €75bn. The European Union also staked out its position on reforming global financial market regulation, the focus of an upcoming G20 meeting in April. Current speculation is that the meeting of the G20 will likely pit Germany and France, which favor stricter regulation, against the United States and China, with the United Kingdom falling somewhere in the middle. However, all sides are currently playing up the likelihood of compromise. 2. On Saturday, the Abhisit Vejjajiva’s government in Thailand survived a no confidence motion in the national legislature. Vejjajiva has been in office for only three months, but has been under fire nearly the entire time, as Thailand has been plagued by political and economic instability compounded by declining exports, part of the impact of the global economic crisis. 3. On Thursday, the government of China announced it would step up naval operations in the South China Sea, specifically targeting the disputed Spratly Islands. The Spratly Islands are claimed (in whole or in part) by at least six countries, including Brunei, China, Malaysia, the Philippines, Taiwan, and Vietnam. The announcement comes after a standoff between U.S. and Chinese naval vessels earlier this month, when the U.S. accused China of harassing a U.S. naval vessel operating in the South China Sea. China maintains the vessel was operating illegally in Chinese waters. 4. Israeli President Shimon Peres last week granted Likud party leader Benjamin Netanyahu two more weeks to form a coalition government. Netanyahu’s right-wing Likud party was named by Peres as formateur party after extremely close restuls in national elections earlier this month. Netanyahu has the option of forming a coalition with a group of far-right and religious parties, but has been seeking to form a more centrist coalition with either Ehud Barak’s Labour party or Tzipi Livni’s Kadima party. A more centrist coalition, Netanyahu believes, would be better positioned to avoid potential clashes with the United States. But both Labour and Kadima remain hesitant to join a coalition government with Likud. 6. A standoff between farmers and the government in Argentina last week threatens global food markets. Farmers are angry about the imposition of a 35 percent duty on soya exports and bans on export of some other food commodities. A similar standoff last year resulted in nationwide strikes and export bans. The standoff in Argentina has the potential to influence global food prices, as Argentina is one of the word’s largest food exporters—second only to the United States. China is the largest consumer of Argentinean soya exports. Over the past week we’ve seen a lot of news from the domestic U.S. political front: Obama’s speech at the Democratic National Convention, McCain’s pick of Sarah Palin for his Vice Presidential candidate. What’s been going on in the rest of the world? Here are five important stories from the past week. 1. The worldwide economic downturn continued last week. On Friday, the Japanese government announced a new economic stimulus package. Analysts are holding out little hope that it will make much of a difference. In the United Kingdom, Chancellor Alistair Darling conceded that the current crisis will likely be “profound and longlasting.” He forecasted that it might be the worst economic crisis faced by the United Kingdom in the past 60 years. Similarly, figures released by the Canadian government last week show that the country is on the brink of recession, with gross domestic product growing by a mere 0.1% in the second quarter. All of this suggests that the current economic crisis is global in scope and potentially long in duration. 2. Ongoing political violence in Thailand last week culminated in the closure of three major international airports and blockades of the country’s rail, road, and port infrastructure. Earlier in the week, protestors had laid siege to state buildings. The protestors—a loose coalition of business, royalists, and activists under the banner of the People’s Alliance for Democracy—are demanding the resignation of Prime Minister Samak Sundaravej and his government. So far, the military has refused to become involved in the political crisis. 3. In an interview on Tuesday, Zwelinazima Vavi, leader of the Congress of South African Trade Unions, declared that South Africa would need to radically change its economic policies to avoid the “ticking bomb” of poverty, unemployment and crime. Vavi is a close ally of Jacob Zuma, the leader of the African National Congress and the person mostly likely to become president of South Africa after Thabo Mbeki’s term expires next year. Many analysts believe Vavi’s views reflect the policies favored by Zuma. Many South Africans believe the economic policies pursued by Mbeki have not improved the quality of life for ordinary people. His complete interview is available through the Financial Times website. 5. In a report issued Thursday, the World Health Organization (WHO) condemned health inequalities between rich and poor around the world, describing them as “unfair, unjust, and avoidable.” According to the WHO “a toxic combination of bad policies, economics, and policies [was] killing people on a grand scale.” The complete report, entitled Social Determinants of Health, is available through the WHO website. Is Climate Change a Laughing Matter? The Independent Newspaper has published a series of political cartoons from around the world on the topic of climate change. The cartoons were gathered as part of a contest promoted by the Ken Sprague Fund, which encouraged artists to submit their creations. After receiving submissions from 300 artists in 55 countries around the world, the Fund chose its favorites. After developing a shortlist of the top 16 entries, the Fund chose its favorites. First place went to Mikhail Zlatkovsky of Russia, second to Constantin Ciosu of Romania, and third to Tawan Chuntraskawvong of Thailand.